MEANS THREE TIMES THE FUN! He used to be perfect, but now he’s even better! 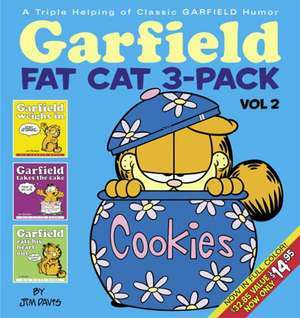 Garfield, the fat cat with the super sized ego, is back in the spotlight, dissing his dimwitted owner Jon – even pilfering his pants. Some cats chase mice; Garfield prefers to take legal action. When down on the farm, the city kitty puts up with-and puts down-Jon and his barnyard brother. No wonder Garfield’s often in a bad mood. But no matter what, he’s always in the mood for food! Jim Davis was born on July 28th, 1945 in Marion, IN. He later attended Ball State University in Muncie, IN where he distinguished himself by earning one of the lowest cumulative grade point averages in the history of the university. (Incidentally, a fellow classmate named David Letterman earned the other). The Garfield strip was born on June 19th, 1978, syndicated in 41 US newspapers. Today it's syndicated in more than 2,500 newspapers worldwide with 263 million readers. 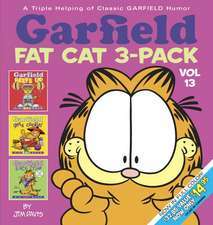 Recently, Guinness World Records‘, named Garfield "The Most Widely Syndicated Comic Strip in the World." Jim Davis has had many successes with Garfield including four Emmy Awards for Outstanding Animated Program and induction into the Licensing Hall of Fame (1998), but his most prized awards are from his peers in the National Cartoonist Society: Best Humor Strip (1981 and 1985), the Elzie Segar Award (1990), and the coveted Reuben Award (1990) for overall excellence in cartooning.